This San Francisco based company creates some of the most delicious, healthiest gourmet edibles you’ve ever eaten—not just scrumptious sweet treats, but more complex flavors combinations of savory, salty, spicy and sweet for every palette. You’d crave Auntie Dolores’ snacks even if they had no medical marijuana. They’re that good. Founded by Juliana Carella in 2008, Auntie Dolores was named after Dolores Park, one of Frisco’s most popular public parks; plus in Latin and Spanish dolor means “pain,” so “anti dolores” (against pain) is a clever pun. Sorry if you thought these THC infused snacks were made by a sweet, little old lady. The company is committed to making edibles that’ll help health-conscious patients improve their quality of life (check out their manifesto). Everything is made in-house, accurately labeled, and lab tested for a consistently delicious and safe experience. 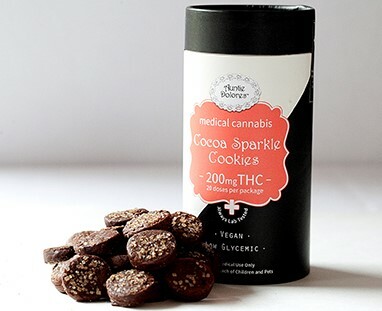 All their edibles are infused with CO2 cannabis oil using a proprietary, supercritical extraction process, derived from blended and balanced hybrid strains. They also preserve the terpenes to enhance aroma and taste, providing a wider range of cannabinoids for a more balanced effect. 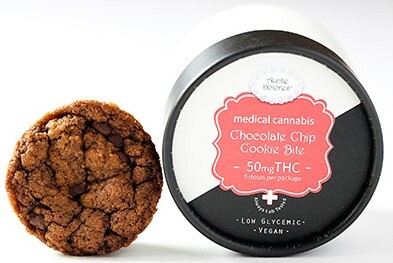 Let’s take a look at what auntie Dolores has to offer, starting with her more unique and snackable medical marijuana treats. These protein-rich peanuts are gluten and sugar-free and flavored with lime, chili, and garlic. If you like spicy-tart flavor combos, you’ll scarf these down quickly because they have an addicting hotness followed by a heavy lime aftertaste. If not, you’ll probably eat them as recommended—five per dose (10mg) slowly over the course of the day. Either way, keep some cold liquids handy as you munch. 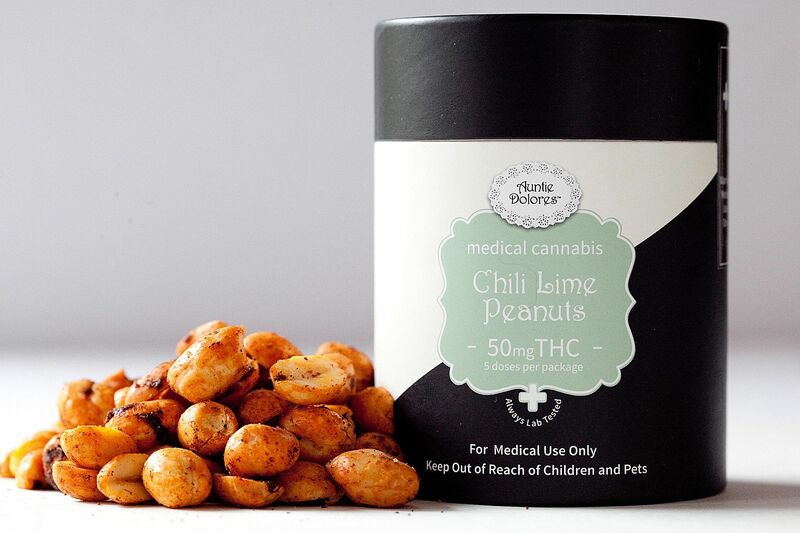 Chili Lime Peanuts cost about $15 per canister, so the price is right, and actually test a bit higher than the labeled 50mg THC. 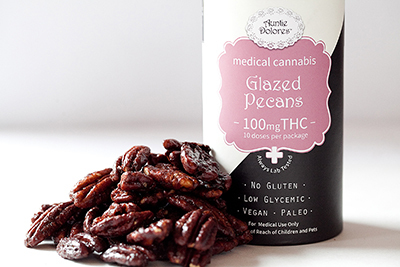 These 100mg THC ($20) glazed pecans are a three-pronged treat! Firstly, they have a gourmet flavor you’ll flip for since their ingredients are as simple as they are flavorful: balsamic vinegar, organic coconut, chipotle powder, cayenne pepper, and kosher salt. Add them to salads, desserts, or just eat them right out of the package. Secondly, snacking on this delicacy will keep you medicated for a few solid hours, depending on your tolerance; auntie recommends starting with a single dose (about five), or just 10mg of THC, though that’s hardly enough to feel glazed over. Still, proceed with caution. Lastly, this classy epicurean delight provides an excellent source of manganese, protein and unsaturated fats without compromising taste. And as a special bonus for you more health-conscious patients, they’re paleo, vegan, gluten-free and low glycemic. 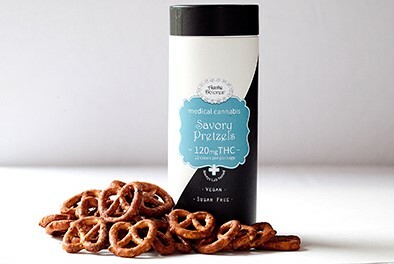 Auntie Dolores’ flagship product, these savory mini-twist pretzels are spicy, vegan, sugar-free, potent and downright delicious. Coated with cayenne, cinnamon, clove, paprika, onion, garlic, ginger, mustard and tamarind, there are 120mg of THC (about $23) in each container. We’re willing to bet you can’t eat just three of the recommended 10mg dose! Want this great taste and medicinal benefits without the psychoactive fun? Try the 60mg CBD version (roughly $25). Oh boy, sweet, savory and delicious! 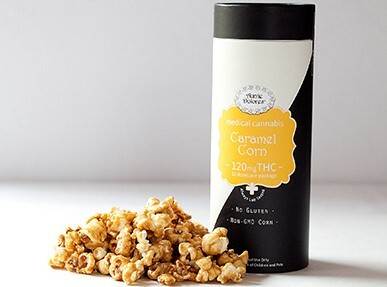 Auntie has outdone herself with these 120mg THC canisters of crunchy kernels (about $22). Movie night’s never felt so good. Again, the labeling suggests trying 3 or 4 pieces (10mg), but you know caramel corn…the pieces tend to stick together and pretty soon one dose turns into five. Their ingredients are all-natural and gluten-free: cannabis oil, hand popped non-GMO project certified corn, brown sugar, butter, pure vanilla extract, and kosher salt. We recommended consuming no more than half the canister, even for high-tolerance patients, or auntie may have you crying uncle! What the heck are infused cheese biscuits? 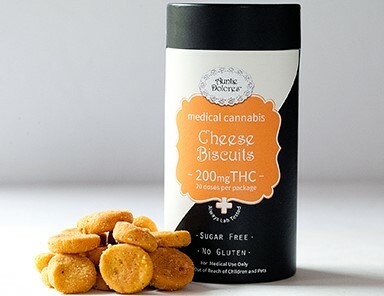 Actually, they’re cheese crackers gussied-up with 200mg of THC in every $20 container. These sugar-free snacks are made from sharp cheddar cheese, mustard powder and paprika, only with a milder flavor and heartier texture. Auntie Dolores claims you can freeze them in a Ziploc bag for up to six months without losing flavor or potency, but why save them for later when they’re so good? 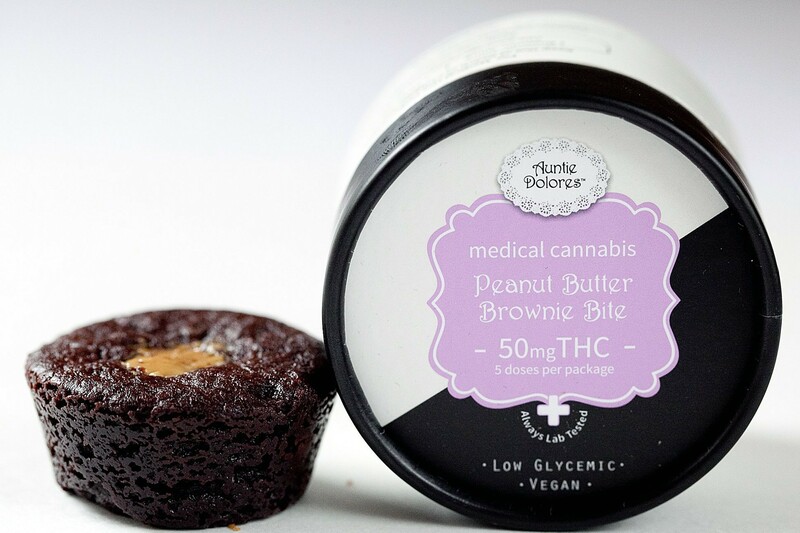 Now that you know about the health conscious products, let’s take a close look at her more traditional, cannabis infused chocolate based sweets. 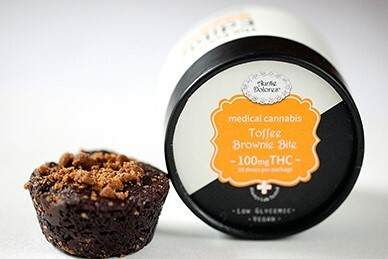 Made from the same recipe as its stronger brother, this version only has 10mg THC (around $5), so it’s ideal for new patients and featherweights; and, unlike the others, it’s low enough to eat in one bite! This 50mg THC incarnation combines soft, brownie texture with classic chocolate chip flavor in a small vegan treat. Cut it in half or into quarters if you have a low tolerance, but if you’re a more experienced patient it can be eaten in one sitting. Costs around $10. Moist, gooey fudge 50mg THC brownie is the perfect combination of light, fluffy chocolate cake with thick, sticky peanut butter. A fat dollop sits in the center, so when you bit into it you get more complex combo of flavor and texture. This’ll also set you back $10. 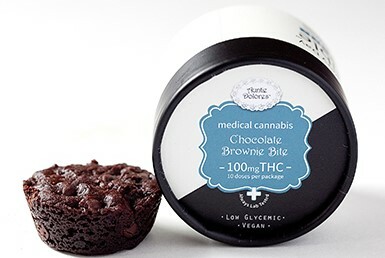 Small but potent, this 100mg THC baked choco brownie-muffin is made with organic Dutch cocoa and chunks of mini-fudge; not to mention it’s vegan, low calorie and low glycemic. We recommend dividing it into quarters (25mg) or eighths (12.5mg); only eat the whole thing if you have an extremely high tolerance and/or in severe pain. About $15 each. Another bite-sized 100mg THC brownie, only this one’s topped with pieces of satisfyingly salty, crunchy homemade toffee. The mix of soft and brittle texture makes for a very enjoyable medicating experience. Split it up or crumble over your favorite dessert. Around $15 a piece. One of auntie’s seasonal products, these mini-cocoa cookies are made with semi-sweet chocolate chips, organic Dutch cocoa, cacao nibs, and sweetened with turbinado and coconut sugars. They come in 200mg THC canisters (10mg per dose) that sell for about $30. Also vegan, low-glycemic, and sugar-free. 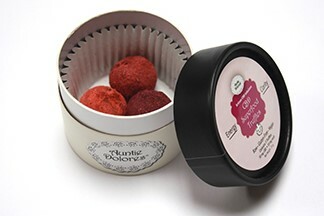 Hemp-derived CBD and other beneficial cannabinoids are packed into three (10mg each) scrumptious, nourishing truffles. They’re full of superfoods like cacao, coconut oil, açaí, blueberries and even a bit of coffee to give you an extra energy boost; and because there’s an extremely low amount of THC, you can savor these at the same time without getting high. 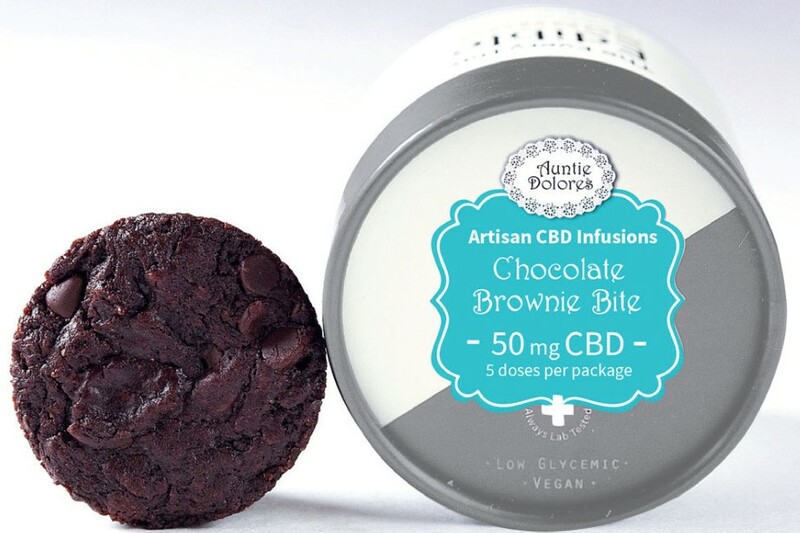 This non-psychoactive version of their scrumptious chocolate brownie boasts 50mg of hemp cannabinoids, like CBD, CBN and CBG. The hemp itself is grown specifically for medical purposes so it leaves you still able to function. Like most CBD products, at $15 these are slightly more expensive than their more fun THC counterparts. Yes, you read that correctly. All mammals, including dogs, have an endocannabinoid system, just like you! 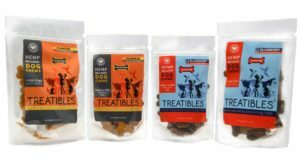 Auntie Dolores now makes infused dog treats under the Treatibles label to help man’s best friend deal with a broad spectrum of conditions. Before you start writing letters to the ASPCA, note that these canine edibles are hemp derived CBD, CBN and CBG. Non-psychoactive cannabinoids only; no THC. They’re available in pumpkin and blueberry flavors, both in small ($24) or large ($35) bags, with one milligram of CBD in every treat. You can do a Google search or check Weedmaps to find a local dispensaries that carry Auntie Dolores, but this can be a tedious and time consuming process, especially if you need to travel, use gas then wait to speak to a budtender who isn’t as helpful as you’d hoped. Instead, use Nugg, California’s premiere online medical marijuana marketplace, to find all Auntie Dolores products closest to you then have them delivered in less than an hour! Don’t have a recommendation? No problem. Just use NuggMD, the easiest, fastest and cheapest way to get your evaluation done online. The entire process takes about ten minutes. Once approved, you’ll immediately be able to order medical cannabis from Nugg, and get $20 towards your first order! While we highly recommend trying all of Auntie Dolores’ products, we suggest starting with their pretzels, pecans and popcorn for a more familiar and nutritional edible. Sure, they cost a little extra than most for the same amount of medication, but their homemade touch, gourmet taste and medical effectiveness make them well worth the price. Don’t sleep on these!